April 12, 2019 -Springfield- On April 10, 2019 the Springfield Police Department responded to 169 Williams Street. Officers were dispatched for a reported motor vehicle accident. Upon arrival responding officers discovered an injured male in the street who appeared to be breathing but unresponsive. He was transported to Baystate Medical Center where he was pronounced deceased. The deceased has been identified as Mr. Jesus Nieves, 54, of Springfield. 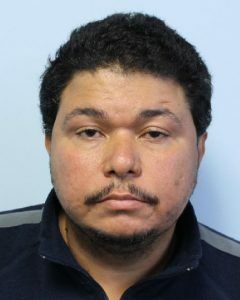 Arrested in connection with Mr. Nieves death is Mr. Juan Antuna, 38, of Springfield. He was been charged with Murder, Assault and Battery with a Dangerous Weapon, and Assault With a Dangerous Weapon. He is expected to be arraigned Tuesday in Springfield District Court. It appears the suspect and victim where known to each other and were engaged in an altercation when Antuna struck his with his vehicle. This is an on-going investigation being conducted by the Springfield Police Department’s Homicide Unit and the Hampden District Attorney’s Office’s Murder Unit. Hampden District Attorney Anthony D. Gulluni extends his condolences to Mr. Nieves’ family during this difficult time.